The first organ in St Paul’s Pro-Cathedral, Valletta (which was consecrated in November 1844) was a rebuild by Gray and Davison of a late 17th century organ by “Father” Bernard Smith. This organ was originally located in Chester Cathedral in England and was reputed to have been played by George F. Handel on his way to Dublin for the first performance of his “Messiah”. This organ was rebuilt by the same firm in 1886, and then again by Goll of Lucerne, Switzerland, in 1905. 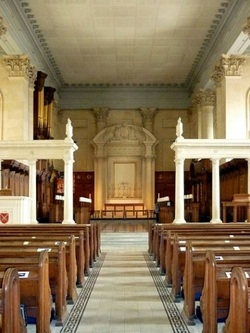 During 1949, the Pro-Cathedral underwent extensive refurbishment, including the re-orientation of the interior by 180 degrees. A new chancel was constructed, incorporating the Altar, the War Memorial, the Bishop’s throne, the choir and canon stalls and the case of the Father Smith organ. At this time the whole organ was rebuilt by the firm Hill & Son & Norman & Beard. The rebuild incorporates some of the pre-existing British and Swiss pipework. The organ case survives intact from the previous instruments. When Queen Adelaide, the widow of William IV, spent the winter of 1838/39 in Malta she was keen to found a Collegiate church in the Anglican tradition. Anglican services were held in a room in the Grand Master’s Palace and it was “insufficient to contain more than the chief English families”.The vast majority of English residents were unable to worship together. Queen Adelaide’s offer to pay for a church overcame all objections. The British Government provided a site, on the spot where the Auberge d’Allemagne (the conventual home of the German Knights Hospitaller) had stood. Queen Adelaide laid the foundation stone on 20th March 1839. Queen Adelaide’s Arms and Banner hang below the organ case. The original building designed by Richard Lankasheer proved unstable and work started again in 1841 under new designs by William Scamp, who had been employed for some years as Clerk of Works to Sir James Wyattville remodelling Windsor Castle. The Dedication of the Church to St Paul, the Apostle to the Gentiles, was a reminder of the first Christian missionary to Malta, when he was shipwrecked on the Island in AD 59/60. Scamps plan envisaged the High Altar at the West end and four side doors, giving the additional benefit of a cooling breeze during the hot summer months. The Bishop of Gibraltar insisted on a more orthodox layout with the altar to the east, so Scamp contrived an apse inside the great doors to hold the sanctuary. Scamp’s rather severe interior with its pillars and fluted engaged pilasters topped by Corinthian capitals supporting a cornice are architecturally in harmony with Malta. The glass windows seem always to have been plain and had to be completely replaced after the bombing in the Second World War. Further necessary repairs after the war prompted a return to Scamp’s original orientation. The west end was transformed into a choir by building a new stone screen across the nave. The screen incorporated a stone pulpit and lectern, now in wood and presented as a memorial to Sir Winston Churchill. To mark the centenary of the death of Queen Adelaide, the Archbishop of Canterbury dedicated the new chancel on 2nd December 1949 in the presence of Princess Elizabeth, who was visiting Prince Phillip during his period of Naval service in Malta. The former sanctuary at the east end became a Baptistry. The font was moved, from the centre of the west end to the apse. The Undercroft, solidly constructed from the former basement of the Auberge d’Allemagne and as the new foundation of the building, was not used for 80 years. The Bishop opened it on Easter Day 1928 as a church hall. In 1938 it was made a gas proof air raid shelter and in the early days of the conflict was used by the chaplain, his wife and scores of Maltese citizens. Despite the heavy bombing of Valletta during the Second World War and the prominent and vulnerable position of the Cathedral, it escaped serious damage during the air raids of 1941-42, Thus it survived to bear testimony to the valour of those who fought to defend Malta; and to house the memorials of all units of the Navy, Army and Air Force on the oak panels around the Sanctuary. A Merchant Navy Memorial is located on the North wall and a Submariners Memorial Plaque is situated outside, on the north-west wall of the Cathedral, facing Manoel Island. The Undercroft has had major renovation work done during 2005, and upgrading of the lavatory facilities in 2006. The Chancellor’s Lodge adjoining the Cathedral has had major renovation work done during 2008-2009. In 2010 the north east lobby used as the main entrance to the Cathedral was redecorated and the south east lobby below the organ loft, long used for storage, was opened up and decorated as a more convenient entrance for the many visitors to the Cathedral during the week.